This book covers the historical account of the Acts of the Apostles. Like all Scripture inspired by the Holy Spirit the selection of events, personal incidents, and especially the emergence of Paul, the apostle to the Gentiles, is pregnant with meaning and illuminates the epistles that were written at the various stages in the development of God's plans. Every chapter is an absorbing study. 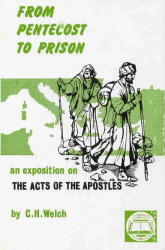 "From Pentecost to Prison" by C. H. Welch is an exposition on the Acts of the Apostles. We need this historical account of what happened after the Lord's ascension until the time that the nation of Israel is set aside, so we can understand where the church started. Did the church find its beginning at Acts chapter 2, 9, 13, or 28? These questions and many others are addressed in this book. What happened at Pentecost? What does the word Pentecost mean? Pentecost was a Jewish feast which was celebrated 50 days counting from the second day of the Passover. This feast in Acts is significant because the Holy Spirit gave gifts to those that were gathered in the upper room. This event was a fulfillment of prophesy. The book of Acts explains that Israel lost her favored position because she rejected Christ as her Messiah. Acts also explains the reason for the sign gifts, Peter's message and its rejection, the stoning of Stephen, Cornelius' blessing and the conversion of the Apostle Paul. At Acts 28:28 we see the final pronouncement on Israel and the salvation of God being sent to the Gentiles.